Hastings resident Nellie Sophia (Hinrichs) Wright, 96, passed away Thursday, October 18, 2018, at The Heritage at College View, Hastings, NE. Services are 10:30 a.m. Saturday, October 27, at St. Paul’s Lutheran Church, west of Glenvil with Pastor Renee Johnson officiating. Burial will be in St. Paul’s Lutheran Churchyard Cemetery. In lieu of flowers, memorials may be given to St. Paul’s Lutheran Church. Visitation will be 1-8 p.m. Friday, October 26, at the funeral home, and one hour prior to the service at the Church. Nellie was born August 31, 1922, to R.K. & Sophia E. (Stamer) Hinrichs on a farm in Adams County, NE. She attended Rural School District 17 and graduated from Hastings High School in 1940. She graduated from the Nebraska College of Commerce and worked at U.S. Naval Ammunition Depot in Hastings as a clerk stenographer. In 1942, Nellie moved to Washington D.C. to work for the Department of State, Visa Division. She was hired as a clerk/stenographer and worked as a court reporter for the five Interdepartmental Visa Committees. She attended six United Nations conferences, four in New York, one in Paris, and one in Geneva. Nellie returned to Nebraska and married Gail R. Wright on August 24, 1952, at St. Paul’s Lutheran Church, west of Glenvil, NE. Although they never had children of their own, they were a “summer home” to many nieces and nephews. Nellie and Gail farmed all of their lives. They also enjoyed fishing, traveling in their motorhome and traveled all over the United States, including Alaska, Canada, and Mexico. 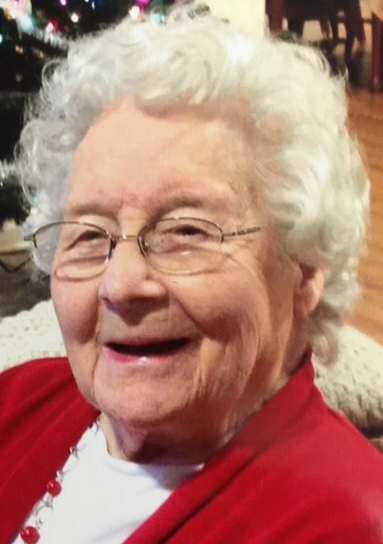 She was a member of St. Paul’s Lutheran Church, west of Glenvil, WELCA, and Good Sam’s RV Club. Nellie was preceded in death by her husband, Gail; parents; brothers, Edward (Zelma) and Paul; sisters, Alice (Tex) Gordon, Hilda (Richard) Burke, Irma (Charles) Hunt, Geraldine “Jerry” (Pete) Petersen; and brother-in-law, Bob Quirk.